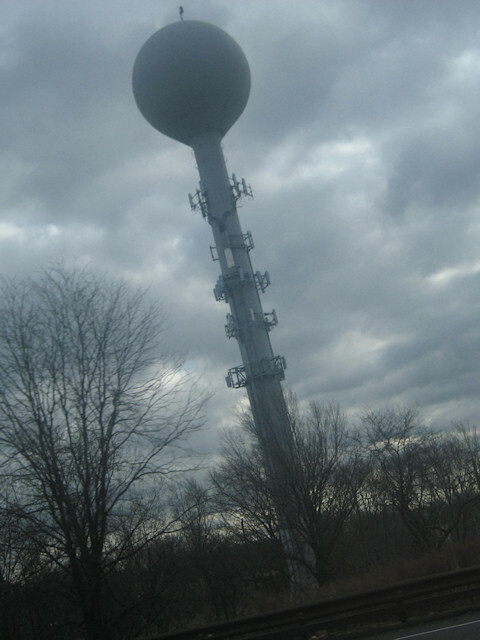 This gravity defying action shot of the World’s Tallest Water Sphere was taken recently from a speeding automobile traveling north on the Garden State Parkway. Thanks to Gina Signorella-Arlen who enlisted the help of her family in capturing this shot safely while navigating crowded swarms of swerving New Jersey drivers attempting to perform the same maneuver. This is the terrifying image that millions witness every day. I love the color, the clouds, and the trees in this photo. Imagine the tension and fear that viewers might experience as they are driving along the New Jersey highways and seeing the World’s Tallest Water Sphere for the first time. “A steel tower appears on the horizon. Interesting, perhaps a water tower. That’s odd. It is the tallest water tower I have ever seen. It looks nearly white, and yet it blocks the sun behind it. As I drive closer in the winter’s cold, the tower appears even taller, stretching its massive hammer head toward the clouds. It stands by an icy swamp. Dead trees and gray chill all around. Balanced, top heavy, apparently upside-down, it challenges gravity and defies the lashing winds. Nearing, it appears to be too close to the road. Perhaps it is actually in the road? Am I going to have to swerve to avoid hitting this beast? By the second, I am coming closer to this monster. I cannot stop my car now. Maybe if I stay in this group of other vehicles it will not see me. Perhaps if I accelerate I can avoid being smashed by this giant gray steel bludgeon! This entry was posted on Saturday, January 16th, 2010 at 8:56 am	and is filed under Art, Experiences, Photos. You can follow any responses to this entry through the RSS 2.0 feed. Both comments and pings are currently closed.